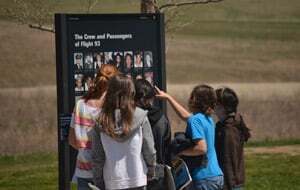 The Friends of Flight 93 National Memorial and the National Park Service offer a new, twenty-minute orientation video which introduces visitors to the Flight 93 story and orients them for a visit to Flight 93 National Memorial. This film was produced in-kind by Wild Excellence Films. The film is an educational tool meant to guide visitors throughout the memorial, which is designed as a self-guided site. The video provides viewers with an in-depth look into the memorial's construction from concept to each final feature. It also includes a description of the memorial design, information on the landscape, events, programs, and a presentation of the names and photographs of the passengers and crew of Flight 93. You may order a copy of the DVD to share with your group. If you would like to have a copy of this DVD to show at your group meeting, in your classroom, or on board the motorcoach as you travel to the memorial, please complete the purchase order form below.